Luxury carpet is for those that want to invest in a floor covering that enhances the interior of a home. With the popularity of hard surface floorings such as tile and hardwood flooring, luxury carpet often gets overlooked. However, as a homeowner or decorator, you can do so much more with luxury carpet than with other types of flooring. It is much easier to draw out colors and textures with luxury carpeting because of the extensive offerings available. Colors in a room can be accented easily with the choices or patterned, printed, or multi-toned luxury carpets. Also, rooms don’t have to have a flat texture. The texture of the walls, ceiling, windows, and furniture can be supplemented by luxury carpet styles like high low, cut loop, patterned and sculpted. Luxury carpeting is not a specific style. The term luxury, when mentioned with carpet, implies longer lasting, softer yarns, better stain resistance, and thicker constructions. There are 4 primary types of luxury carpets to consider when you are designing the perfect room setting. Plush carpets are commonly thought of as one of the primary luxury carpeting choices. Plush carpet can be textured, velvet (Saxony), or trackless. The common theme with plush luxury carpets is the height of each yarn is the same. This creates a uniform appeal to the carpeting. The thick, dense velvet plush versions can imply a very formal, rich feeling in a room’s design. Textured plush luxury carpets can have what appear to highlight due to the way the yarn is slightly crimped and twisted. Although the colors of the yarn are the same, the highlights can appear to brighten a room somewhat. Shag and frieze luxurious carpeting is a very hot trend. The deep, thick feel of a shag floor is wonderful to the feet and gives a warm, comforting feeling to a decor. The shag’s cousin, frieze carpeting, is similar that it gives a casual look and feel to a home’s aura. Shag carpeting tends to have big, bulky yarn whereas, frieze has tightly crimped and high twist amounts in the luxury carpets yarn system. Both of these types can give a wonderful warm feeling and add a slight texture to the room due to their design. Patterned luxury carpeting had faded out for a while as a common option for floor covering. However, it is roaring back and poised to be the next big hit. Manufacturers are now offering more styles than ever in patterned luxury carpets. 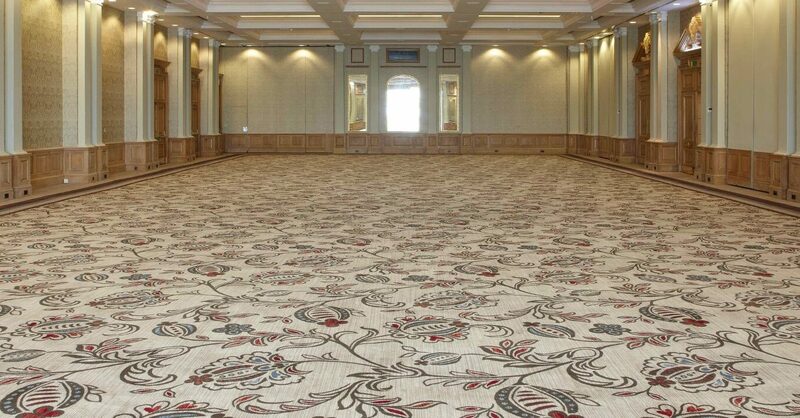 The amazing thing with the newer patterned carpet styles is that both formal, traditional as well as contemporary designs are being manufactured. Coupled with bold, new colors, patterned carpet is now a designers dream. The high low effect that patterned luxury carpeting has gives amazing texture appeal to rooms. Berber carpeting is still very popular due to the ability to blend several contrasting colors into the large loops. The manufacturing of luxury, Berber carpet lends itself well to adding different colors of yarn into the loops themselves. By having a base color, usually an earth tone shade, the other contrasting colors call pull other color schemes in the room out like no other form of luxury carpeting. When considering Berbers, stay with 100% nylon yarn or wool yarn. These yarns will last much longer than other blended yarn types used in standard Berber carpeting.